This is a free event, tickets are not required. Vibraphonist/vocalist Roy Ayers is among the best-known, most-loved and respected jazz/R&B artists on the music-scene today. Now in his fifth decade in the music business. Ayers, known as the Godfather of Neo-soul, continues to bridge the gap between generations of music lovers. In the ’60s he was an award-winning jazz vibraphonist, and transformed into a popular R&B bandleader in the ’70s/’80s. Today, the dynamic music man is an iconic figure still in great demand and whose music has been sampled by music industry heavyweights, including Mary J. Blige, Erykah Badu, 50 Cent, A Tribe Called Quest, Tupac, and Ice Cube. 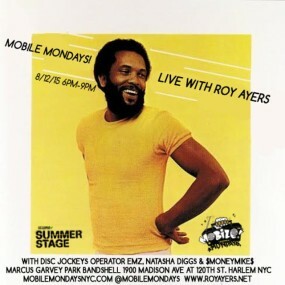 Always the consummate showman, Roy Ayers has managed to incorporate his jazz virtuosity, with driving funk, melodic rhythms and stirring vocals into an amalgam that almost defies its description as “smooth jazz”. Roy Ayers is and shall always be a music icon and a part of popular worldwide culture… he is, without question, a legend in his own time. Mobile Mondays! is a NYC Music Movement founded by Operator Emz & take place every Monday at The Bowery Electric. The MM Mission is to keep real music alive, preserve & celebrate DJ culture & bring back the vibe & soul of NYC. Mobile Mondays! encompasses all the great eras of NYC Nightlife Culture & the TRUE NYC Sound. We are Funk & Soul, Rock & Roll, Pop, Reggae, Rhythm & Blue, Disco & anything else classic & danceable on 45 RPM singles. The MM All Stars include Operator Emz, Joey Carvello, Natasha Diggs, Just Blaze, Misbehaviour & $$$Mike. MM Brings NYC’s vinyl rats, music lovers & artists together & takes NYC back to an era when DJ’s dug a little deeper. For the artists & creatives who congregate Mobile Mondays! is a chance to go back to the city they love best, when records were events, the dj was on the pulpit & the dance floor was epic. Operator Emz is a DJ, music producer & hop hop expert. He is a noted collector & curator based in New York & Mobile Mondays! Founder. In the 90’s Greene went from college radio to co-host one of the first commercial hip hop radio shows in LA. The Joint on KBET, Emz combined his encyclopedic knowledge of music with sardonic humor earning fans & making “King Emz”. He also found himself working at the new minted Interscope Records as a promotor of records like “The Chronic”. After years on the business side of the music industry, Emz turned his focus to production & events. He produces records for Cyndi Lauper, MIA, Joel Ortiz & collaborates with artists like long time friend John Stainer of Battles. In 2013 Adidas asked Emz to help design the Adidas Pro Model for the Adidas Collectors Project. As a DJ Emz has worked for Nike, Sony, Warner, Universal & Absolut for events worldwide. For well over a decade Natasha Diggs has been digging deeper to provide the soundscape for events across the globe in cities such as New York, Tokyo, Sydney, Beijing, Prague, Los Angeles and Berlin. As resident of New York City’s premiere all-vinyl 45 party, Mobile Mondays!, Diggs has become a force to be reckoned with and one of the most sought-after DJs in the 45 game. Whether playing all vinyl or not, Natasha has been recognized for her eclectic taste and diverse musical knowledge and on any given night her sets might dip into soul, funk, disco, rock, hip hop, house, world music and beyond. Natasha has played alongside or opened for artists such as Lauren Hill, Erykah Badu, Grandmaster Flash, Rakim, Dam Funk, The Pharcyde, Kenny Dope, Large Professor, Mark Ronson, Omar, DJ Spinna, Cut Chemist, Spinderella, DJ Scratch, Prince Paul, Just Blaze, DJ Muro, and many more. $Money Mike$ A.K.A. “Quiet Storm” Michael is a Native New Yorker who actively began spinning in the late 90’s. while the heart of his sound is Hip Hop influenced, his aspirations to produce led Him to discover other styles of music. His style is now dominated by R&B, Soul, Funk, Disco, Jazz and Reggae. Michael is also known for working at the legendary Rock and Soul Records for the past 12 years & also A1 Records.